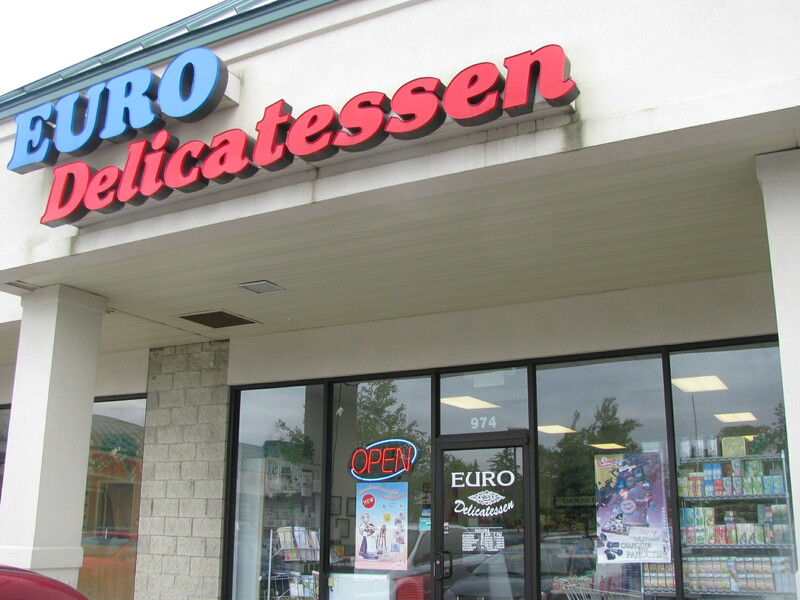 The business card says that Euro Delicatessen is “A mini grocery store specializing in European Foods,” but this claim is modest -for anyone looking for Eastern European delicacies, this is a treasure trove. 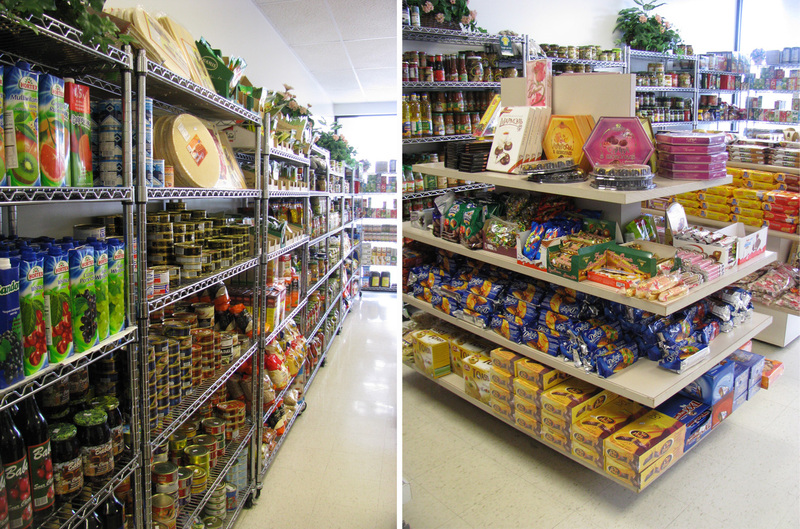 This clean, bright store sells candies, bread, packaged baked goods, cured meats, pickles, teas and a variety of other hard to find items. 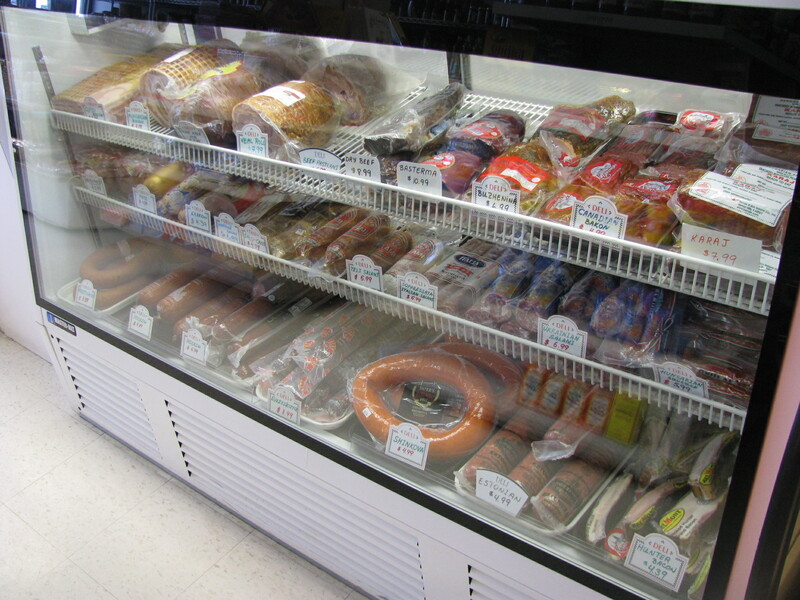 Our attention, unsurprisingly, was mostly captured by the two refrigerated cases of sausages and pork products containing 3 or 4 types of bacon and many many types of kielbasa sausage including kabanosy and moldavska. Sausages hailed from countries including Russian, Poland, Hungary, Estonia and the Ukraine. We were given tastes of several of the sausages to aid in our decision making. It didn’t seen to help as each one seemed better than the last. 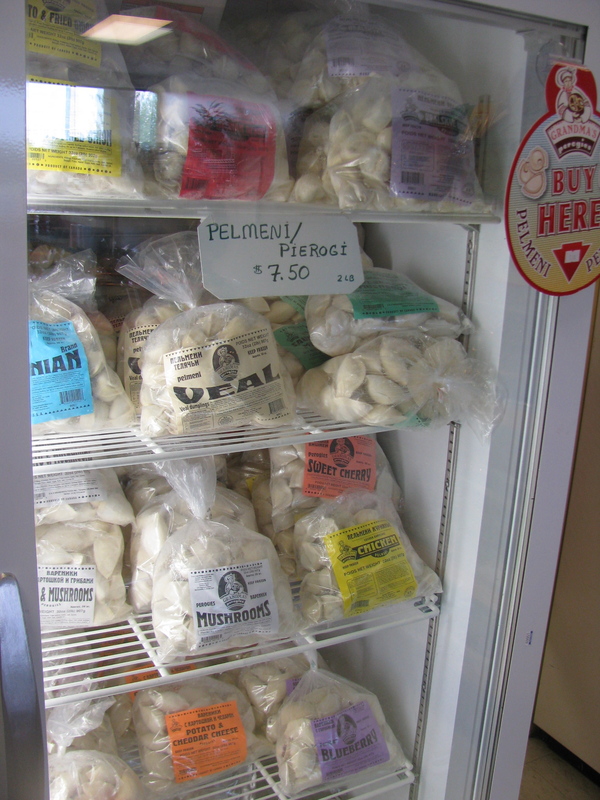 We were also interested in the wide variety of pierogi and pelmeni – almost twenty varieties mostly from Grandma’s pierogis in Toronto, but there were some homemade pelmeni. There were also whole smoked mackerel and other smoked fish, cheeses, kvass (a drink made with fermented rye bread), kefir (a fermented milk drink) and, as befits somewhere selling pierogis, plenty of butter and sour cream. 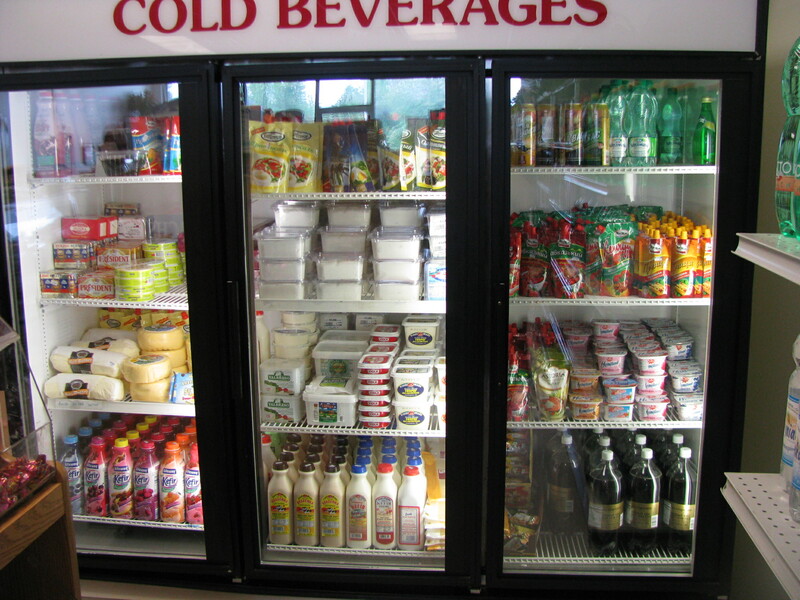 This entry was posted in European, Grocery store and tagged eastern european, kielbasa, kvass, Pierogi, russian. Bookmark the permalink. Yup, there’s a Russian & Ukrainian presence way out here (along with Hispanic and Somali). Glad to know there’s a food component too. Also, there’s Romashka groceries on W Dublin-Granville west of Linworth. Just wish one of them was closer. I can vouch for the awesomeness of their frozen dumpling products. The pelmeni are just like the kind my mom makes! Also, look for Cows in the bins of loose candy at the back of the store. They’re soft caramel candies–sweet, but with a really rich, creamy milkiness kind of like dulce de leche or a spoonful of sweetened condensed milk. The ones I recommend are called “Luxury Cream Fudge,” and they have a goofy-looking cow on a yellow, red, or white paper wrapper. The texture should be soft and chewy. They are delicious to the max.